As it happens, this is a chocolate banana peanut butter smoothie because the sweetie man got me chocolate almond milk by accident. Which to me is just a little bit chocolate, and a lot sweet. I'm okay with something this sweet before or after a workout, so it's okay and you might like it a lot. I'd probably like a banana peanut butter smoothie made with plain almond milk just as well. 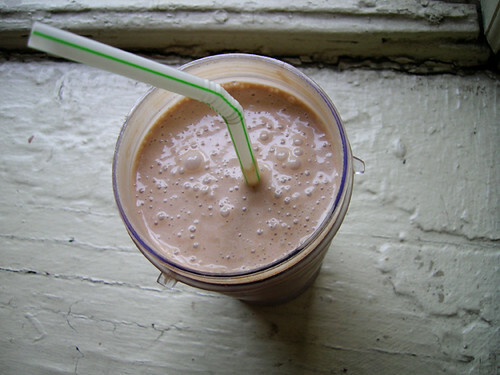 Bananas are sweet on their own, not just with chocolate almond milk. So no added sweetener necessary in my opinion, and especially not with the chocolate almond milk. I thought this would go without saying, but when you freeze bananas for smoothies? Peel them. And also break them up into pieces, so they blend better. Ha ha, love you Nin! Nin has a great story actually, I might have her on to talk about herself. Put the banana in the blender cup. Spoon in the creatine and then four heaping spoonfuls of yogurt, which is about a half cup. Rinse the spoon and put in two spoonfuls of peanut butter. Then three spoonfuls of flaxseed oil, which is about a tablespoon. Then pour in almond milk to fill the cup, screw on the cap, stick the cup on the motor base, and blend for 30 seconds. Then take it off the base and give it a little shake to get anything that's stuck on the top of the cup. Blend for another 20 seconds or until the smoothie is churning freely from top to bottom.